The University of Maryland Children’s Hospital (UMCH) is a leading provider of pediatric care. Within UMCH, teams of specialists in the neonatal intensive care unit (NICU) protect our smallest and most fragile patients including low birth-weight babies and critically-ill babies with serious medical conditions. The Drs. Rouben and Violet Jiji Neonatal Intensive Care Unit at the Children's Hospital holds a Level IV designation, meaning that it provides the highest level of neonatal care possible. Continued innovation in research and patient care are key factors in sustaining the level of excellence of the UMCH NICU. 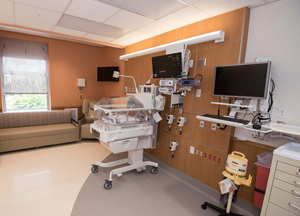 The recently completed NICU renovation and expansion project was funded in part by philanthropy and named in honor of Drs. Rouben and Violet Jiji. This project significantly expands the footprint of the NICU and provides additional enhancements to patient care, and further advances innovative education and discovery that will benefit the most fragile babies. NICU stays can be as brief as 24 hours or up to several months. Having a baby in the NICU is a challenging and often life-changing experience and the impact on families is deeply profound. Every single gift to the NICU makes a difference and your gift to the NICU Campaign will have a lasting impact on patients and families. Learn more about ways you can help here or call Suzanne Boyle, Senior Director of Development at 410-328-2391. Every NICU story is powerful. Learn how our new NICU will impact patients and their families. Meet some of our generous donors, physicians and patient families and to learn more about the NICU. Read a Q&A with Dr. Cynthia Bearer.